In the few hours between the announcement of Google Plus and finding my place in the field test, I was super excited by most of the features, especially Circles. It captured my attention in the tour by saying "sharing the right stuff with the right people shouldn’t be a hassle." Facebook's combination of Friend Lists and custom privacy settings offers a very powerful way to isolate exactly who you want to share certain content with (Screenshot Below). The problem is that so few people know how to utilise it. The Friend List option has all but been hidden away and I doubt that the common user even realises what the padlock on the Sharing field even does. 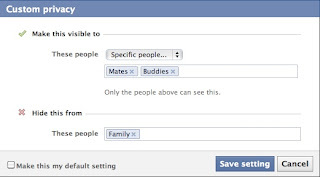 The Facebook privacy settings allow you to make a piece of content visible to select number of people as well as entire lists of people. It becomes even more powerful because it gives you the option to exclude specific people or specific lists of people who may already be included by default in the originally delegated selection of people and lists. Super powerful feature but by the time you have got to this point you have probably lost 95% of your users. Most anecdotes I have heard suggest that many people just delete someone when they are worried about them seeing a certain piece of content. This envitably creates an awkward moment whenever you have to share something with that person in the future or *shock horror* bump into them in the real world. Google Circles on the other hand suggested that it had solved this problem, offering a GUI metaphor to make the ability to isolate content to a specific set of people super easy. The concept was circles and the logo suggested that the GUI implementation would be Venn Diagrams. A visual way of representing isolation of groups that almost every person is familiar with from some of the earliest levels of education. It would be a GUI that allowed you to merge a number of your Circles and select the exact sectors you would like to share content with. This sounded great. I became even more confident when I heard that Andy Hertzfeld had worked extensively on the GUI for the Circles interface. This would have been groundbreaking, like Jonathon Ive often says, it is so simple it just makes sense. Alas, unless I am missing something, this is not the case. Not in the beta at least. 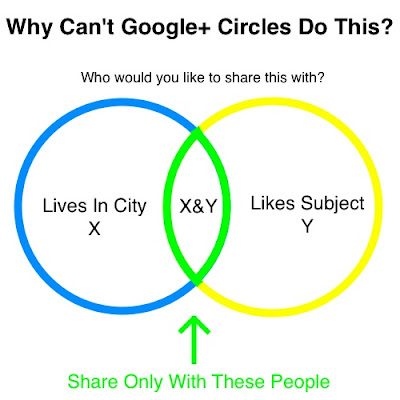 You can share to one circle or a number of circles but you can do no mixing or matching and ultimately, although it is easier to create a Circle than a Facebook Friend List, the interface for sharing content is fairly similar to Facebook except not as powerful. An opportunity missed. So, just in case any Google Plus engineers are reading and they need the concept I'm talking about explained to them, I've made up some scrappy diagrams to help give you the gist. They are not intended to be the GUI, just an example of what the GUI would effectively be doing in the background for the user. So, simply by using a GUI to merge your two circles you can select the merged sector as the specific set of people you would like to share that piece of information with. The GUI could also populate each sector of the diagram with the icons of your friends so that the user gets a clear visualisation of the people they are including or excluding from this information. 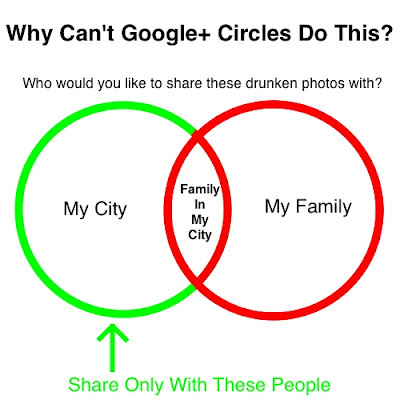 Wouldn't it be great if you could share those hilarious drunken photos with your friends but exclude your friends that may also be your co-workers / bosses / family / crushes etc? What's more, wouldn't it be a whole lot easier to do this if they used a simple GUI based on the Circles they already allow you to create? Sure, this might have taken me a long time to explain, but once you have set this up and presented it to the user, the simple visualisation of how to control what content they sharing and to who will take them forward from there. Currently it seems to be russian roulette as to who I am sharing with now, I can't always remember who is in each circle. Are some people I want to include being excluded? Are some people I don't want to include being included? The current Google Circles interface doesn't help you find this out any easier than Facebook and its the Facebook users Google has to convince to switch.